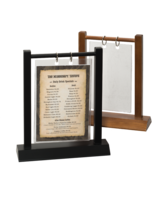 Display multiple products and services with a single table-top menu holder. 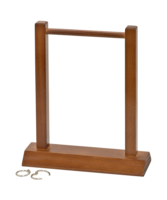 This rugged, hardwood attention grabber sits on your restaurant tables. Up to twenty clear vinyl sleeves hang from the cross bar to help you promote special drinks, seasonal desserts, late night entertainment or whatever else rings your cash register. Size 'A' holds vinyl sleeves for 4 in. x 6 in. cards. Size 'B' holds vinyl sleeves for 5 in. x 7 in. cards. Beveled sides of base affords the perfect place for your suppliers to add brand identity for cross selling products. Smaller size measure 9 in. tall with an 8 3/4 in. x 2 in. footprint. Stands have a 6 in. clearance from rings to base and measure 5 1/8 in. between vertical posts. Larger size measures 10 in. tall, with an 8 3/4 in. x 2 in. footprint. Stands have a 7 in. clearance from rings to base and measure 6 in. between vertical posts. Either size is available in Brown or Black. Prices of stands include two rings per stand. To order sleeves or 3/4 in. diameter rings to fit these stands, click here. Display multiple products and services with a single table-top card holder. 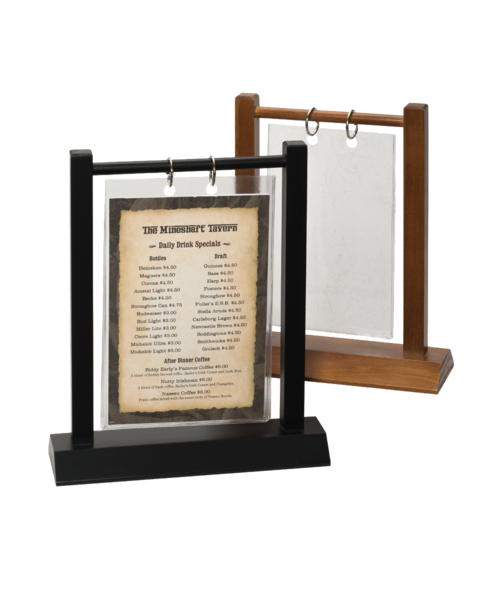 This rugged, hardwood attention grabber sits on your restaurant tables. Up to twenty clear vinyl sleeves hang from the cross bar. Shop online with the Menu Shoppe today.